CIDR (Classless Inter-Domain Routing) has considerably reduced routing table size growth through (a) aggregation of IP addresses into IP address prefixes, and (b) an address allocation policy that creates opportunities for aggregation RFC1518. In this section the concepts of prefixes and aggregation are explained. Then we will examine the benefits CIDR has to offer, as well as its limitations. An (IP address) prefix represents a range of IP addresses, and consists of an IP address part addr and a prefix length part p. A prefix is usually written as addr/p. The p indicates the leftmost contiguous significant bits within addr RFC1518. The IP address range denoted by a prefix addr/p are those IP addresses whose leftmost p bits equal the corresponding bits in addr. For example, the prefix 192.24.0.0/13 (IP address 192.24.0.0 and prefix length 13 bits) corresponds to the IP address range from 192.24.0.0 to 192.31.255.255. When two prefixes have the same IP address part, but differ in their prefix length part, the prefix with the longer prefix length is said to be more specific, and the prefix with the shorter prefix length is said to be less specific. For example, prefix 192.24.0.0/21 is more specific than prefix 192.24.0.0/13. The IP address range of a prefix is a subset of the IP address range of any less specific prefix. CIDR allows a router to aggregate (summarise) a number of IP addresses and IP prefixes into a single IP prefix, and to announce to other routers only the resulting less specific prefix (aggregated prefix) instead of the more specific IP addresses and prefixes that it covers. To significantly benefit from the introduction of aggregation, CIDR also specifies an address allocation policy which creates the conditions in which aggregation can be performed. 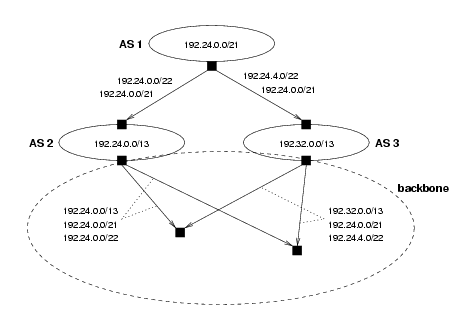 An example of aggregation is shown in the above figure A provider AS (AS 2) has been allocated the IP address block 192.24.0.0/13. The provider has two customer ASes (AS 1 and AS 3). In accordance with CIDR address allocation policy, the IP address blocks assigned to these customer ASes have been allocated out of the provider's address space: AS 1 is allocated 192.24.0.0/21 and AS 3 is allocated 192.24.8.0/21. AS 1 and 3 announce prefixes for these address blocks to AS 2. The announcements are indicated by the arrows. AS 2 is attached to the backbone, and must make reachability announcements covering the address blocks of all three ASes. Due to the allocation of AS 1 and AS 3's address blocks out AS 2's address space, AS 2 is now able to aggregate the prefixes of AS 1 and AS 3 into its own prefix 192.24.0.0/13, and therefore only needs to announce this single prefix into the backbone. The aggregating router is able to announce an aggregated prefix instead of the more specific IP addresses and prefixes that the aggregated prefix covers. This reduces the table size of any routers that learn of this announcement. The number and size of update messages (announcing or withdrawing IP addresses) are reduced. Not only do update messages carry just the aggregated prefixes instead of the more specific information, but CIDR can also prevent instability at the edge of the network to immediately propagate to the backbone Huston. The instability is `absorbed' at the point where the affected address space is aggregated. CIDR allows a more specific prefix of some other prefix to be advertised. More specific prefixes override the routing policies associated with its less specific prefixes, as follows. 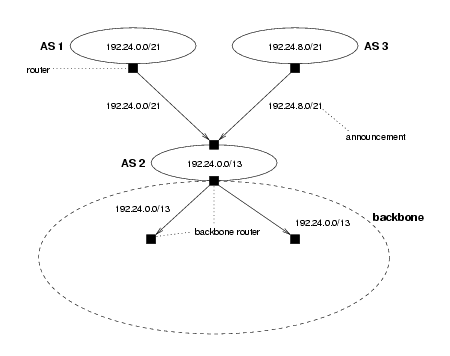 A BGP router that receives advertisements of a more and a less specific prefix, will forward traffic along the AS path of the more specific prefix. A BGP router that has received advertisements of a more and a less specific prefix may aggregate the more specific prefix into the less specific prefix in its advertisements to other routers. However, there is an important reason for choosing not to do so: by advertising only the aggregate, the overriding quality that the more specific prefix has (by virtue of its longer prefix length) is not passed on to other routers, resulting in a loss of policy information. (An example of this appears below.) As a result, BGP routers will often not aggregate more and less specific prefixes, and instead advertise both prefixes to other routers. More specific prefixes are often used for traffic engineering purposes. An example of this is shown in the above figure. AS 1 has two provider ASes, AS 2 and 3, both of which are attached to the backbone. Having several providers, AS 1 is said to be multihomed. One reason for multihoming an AS is to improve the connectivity of the AS. AS 2 and 3 have been allocated the address blocks 192.24.0.0/13 and 192.32.0.0/13, respectively, which they announce into the backbone. AS 1 has been allocated an IP address block 192.24.0.0/21 out of the address space of AS 2. In this scenario, AS 1 wishes to balance the load of its incoming traffic over the two links. To do so, it advertises half of its address space (192.24.0.0/22) to AS 2 and the other half (192.24.4.0/22) to AS 3. To ensure that the whole of AS 1's address remains reachable, should either of its provider links go down, AS 1 additionally advertises its entire address block (192.24.0.0/21) to both providers. Due to the fact that the two more specific advertisements take precedence, load balancing will still be achieved. The prefixes advertised to AS 3 cannot be aggregated into AS 3's own prefix advertisement, and must therefore be advertised separately into the backbone. The prefixes advertised to AS 2 could be aggregated into AS 2's own prefix advertisement. However, that would cause all traffic destined for AS 1 to be attracted towards the more specific prefixes advertised by AS 3, defeating the load balancing objective. Therefore AS 1 convinces AS 2 to announce both the whole and the half block into the backbone. Networks (AS 1) that are not allocated out of the address space of their provider (AS 3) cannot be aggregated into their provider's prefixes. The prefixes of such networks may therefore end up as separate entries in BGP router tables. By allowing more specific prefixes of existing prefixes to be advertised, additional prefixes are introduced that may end up in BGP router tables. Other reasons behind the occurrence of these phenomena are discussed in CAIDA, CAIDA3 and Huston.